The most rewarded type of marijuana in recent years. A a potent strain of cannabis marijuana. 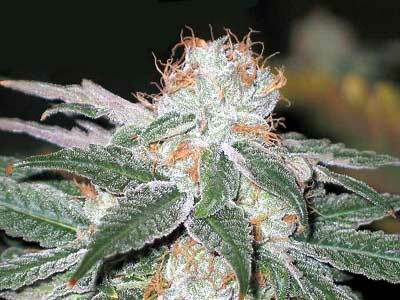 The infamous White Widow strain has one of the highest percentages of THC known to growers and smokers alike. This sticky, sweet plant can be grown both indoors and outdoors—a perfect match for first time growers! Since its inception in the ’90s, White Widow has won numerous awards, including the High Times Cannabis Cup in 1995. Celebrated for its unique, refreshing taste, its strong, skunky smell and its mind-blowing, sugary appearance, White Widow is beyond legendary. The crystal formations on the leaves and buds aren’t just mere eye candy. The dense hairs produce one of the finest quality highs you could ever experience to date. A few tokes of White Widow and you’ll be sent into a floating utopia. A light and airy high bursting with energy, White Widow is a classic, psychedelic sativa strain not to be missed. White Widow is marijuana that has won the Cannabis Cup and is named for the abundance of trichomes, giving the plant a whitish tint. White Widow is a 60% indaca and 40% sativa cross strain. It is said to contain one of the highest percentage of THC of all Cannabis strains, with reported ranges from 18 to 23 percent. 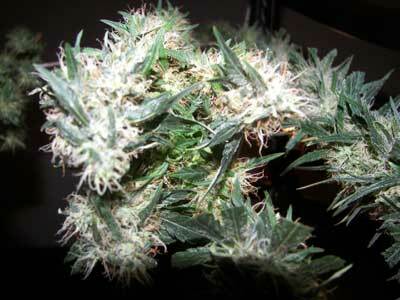 White Widow is one of the more powerful strains of marijuana alongside AK-47 and Afghan Kush. This masterpiece has set the standard for the “White” strains. White Widow grows tall with delicate arms. Buds are moderately compact in order to contain the copious amounts of resin. Leaning on the sativa side, the buzz is powerful yet energetic and very social. According to Sensi Seeds this was the very first white variety on sale. It's been going for some time now and is still popular. I guess this is because of it's good price to quality ratio and the fact that it's easy to grow lot's of it. The smell is balanced but heavy. The taste is pretty heavy as well, lot's of aroma and sweetness, though clearly not as sweet as, let's say, Haze. In strength and smell it's comparable to stuff like NY Diesel, it's definitely a classic.